Durham wrapped up a nine-wicket win victory over Derbyshire before lunch on the final day at Chester-le Street to leapfrog the visitors into seventh place in the Division Two table. Resuming on 305-6, Derbyshire were bowled out for 354, Graham Onions (3-88) taking two of the four wickets to finish with seven wickets in the match. Durham then lost out-of-form England opener Keaton Jennings in reply for 16. But Tom Latham was still there on 23 when Durham reached victory on 39-1. Durham, who were given a penalty of 48 points before the start of the season, claimed a 24-point maximum as they won their third County Championship match in their last five games and a second this season over Derbyshire. Derbyshire pick up just two points from the game to drop to eighth, 23 points clear of bottom club Leicestershire, who will significantly close that gap by the end of the day, regardless of whether they beat Kent at Canterbury. 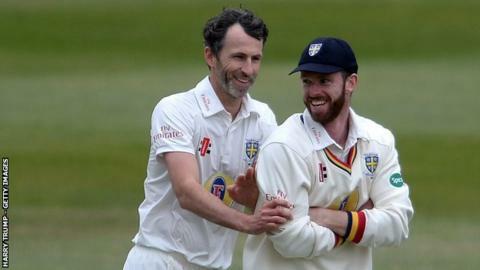 "Durham are certainly heading in the right direction. This was their third win of the season and they are now unbeaten in six County Championship matches. "If it hadn't been for that 48-point deduction by the ECB and the poor start to the season which followed it, Durham could be competing near the top. "As things stand there's no reason to think they can't at least get level with Glamorgan and Gloucestershire and finish in a comfortable mid-table position. "They have Kent and Sussex to come at home, followed by a trip to Worcester and will certainly have a say in who goes up from Division Two."